I am a big fan of Mac N’ Cheese and will not miss the chance of ordering a serving whenever we visit Kenny Rogers. I also used to like the ones they serve at Chansel, yes that pizza chain, we used to frequent their Starmall branch in Mandaluyong. Now as much as I would like to cook my own recipe, you are fully aware that I lack the culinary skills to whip up a delicious version so I decide not to. Until I chanced upon this very simple recipe from the Peach Kitchen, which I thought was easy enough to do. Easy enough, right? I bet you can easily cook it in your own kitchen. My sister and I loved it, but the little man refused to even take a bite. Next time I will try to add in a few broccoli florets, as well as some meat bits so Jared will find it more appealing as much as a remo kids percussion konga at musician’s friend. I will also use a different kind of macaroni shells. 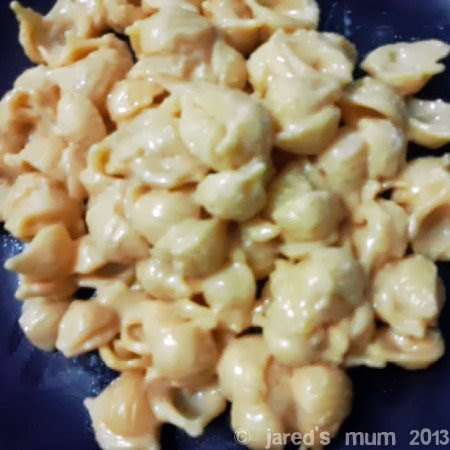 This entry was posted in mum cooks and tagged recipe on 10.August.2013 by admin.